Driving up and down the A1 it is good to know good stopping places. I recommend the Windmill at Tuxford – we’ve been stopping here for excellent home baking since Hannah went to Durham in 2005. Do check their opening days on their website. 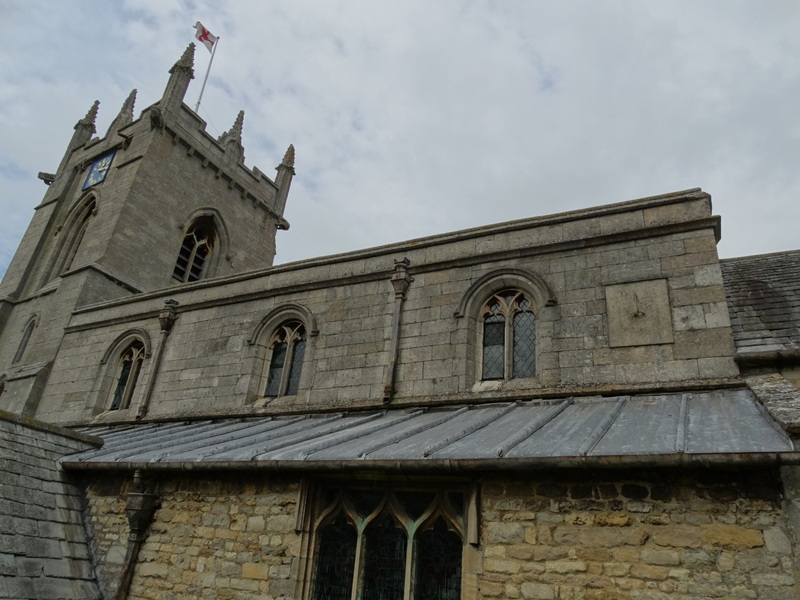 Driving from Suffolk back home we didn’t make it as far north as Tuxford before I needed refreshment, so went to Woolsthorpe Manor instead. 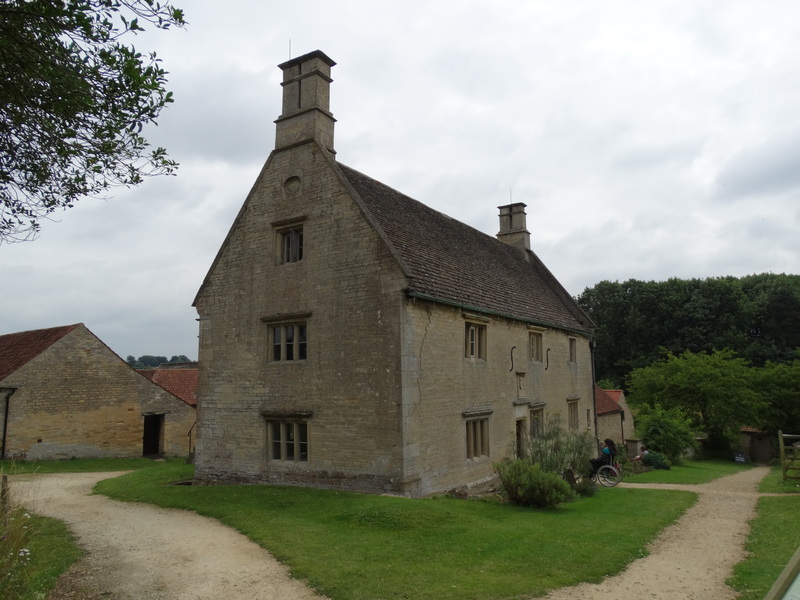 A National Trust property – http://www.nationaltrust.org.uk/woolsthorpe-manor/. “Typical of a small provincial manor house, the house of comfortable, if not particularly affluent, yeoman farmers” to quote the NT guide. 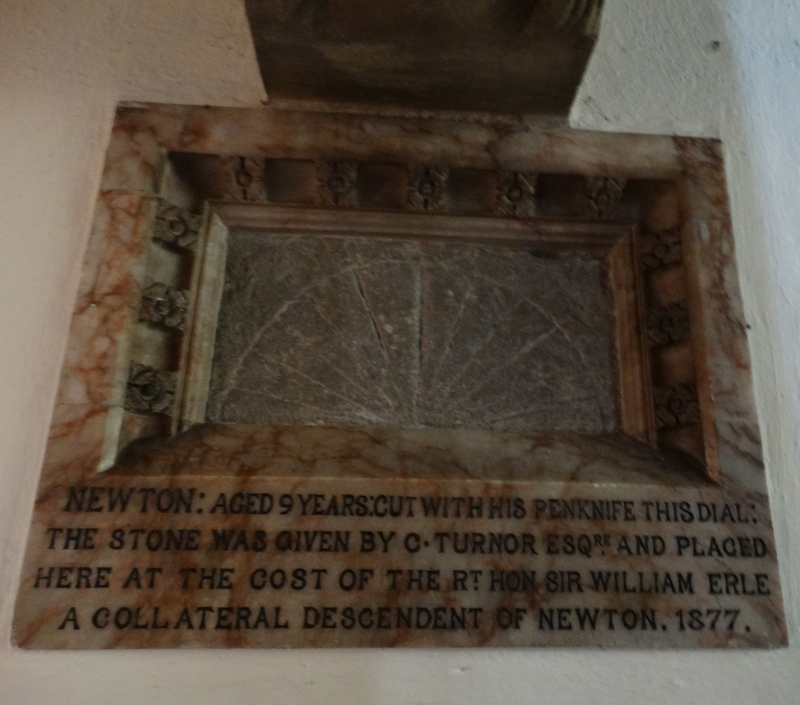 Isaac Newton was born here on Christmas Day 1642. He went to Cambridge, then returned 1665-6 due to the plague. 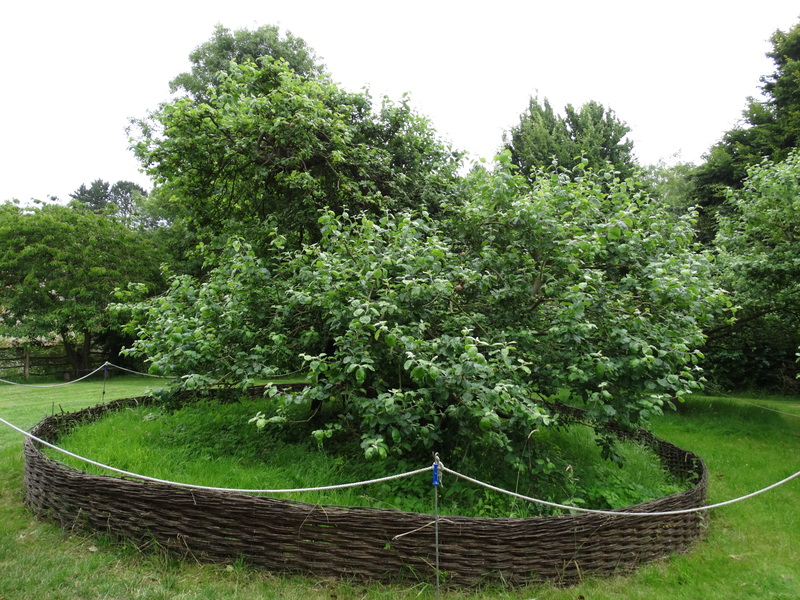 While here he sat under his apple tree. We sat in the cafe! 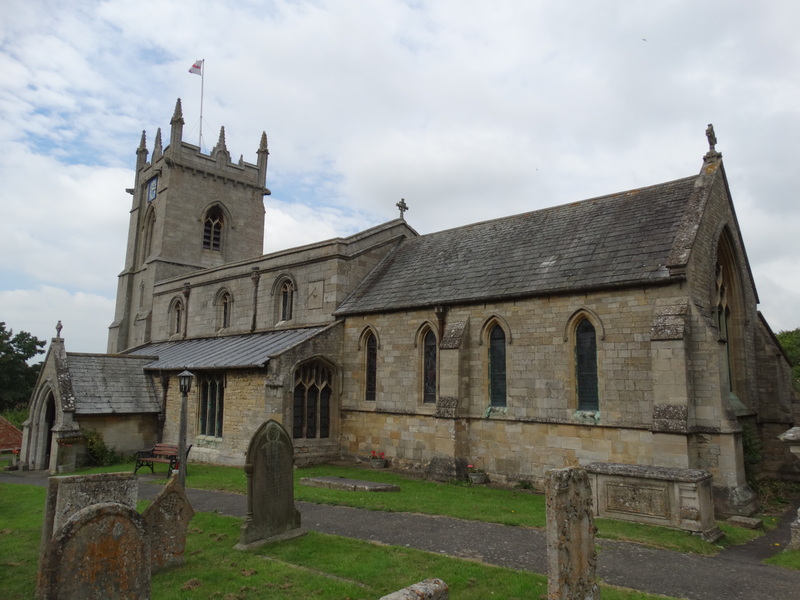 As we left we found a leaflet for St John the Baptist church in Colsterworth, so decided to pop in. Well done the church for being efficient enough to produce a neat leaflet and making it available where the tourists are. 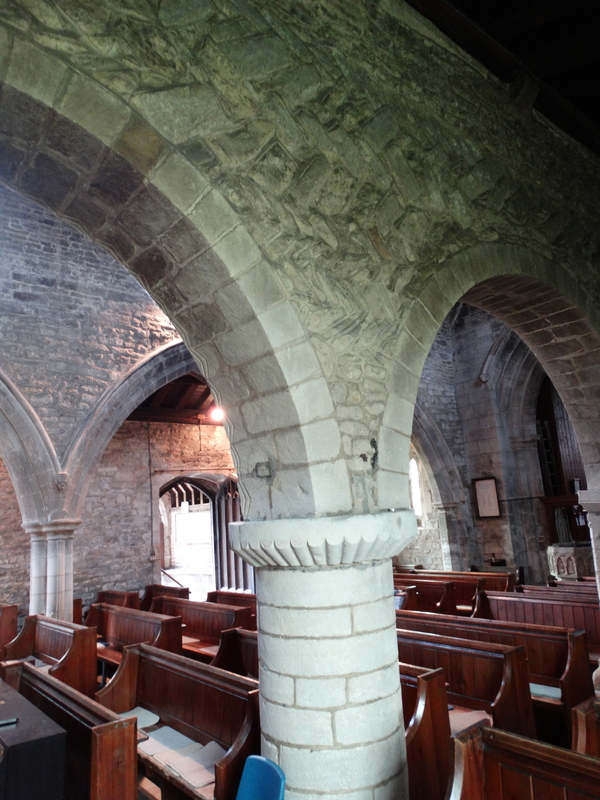 In church I was found by a churchwarden who showed me round. 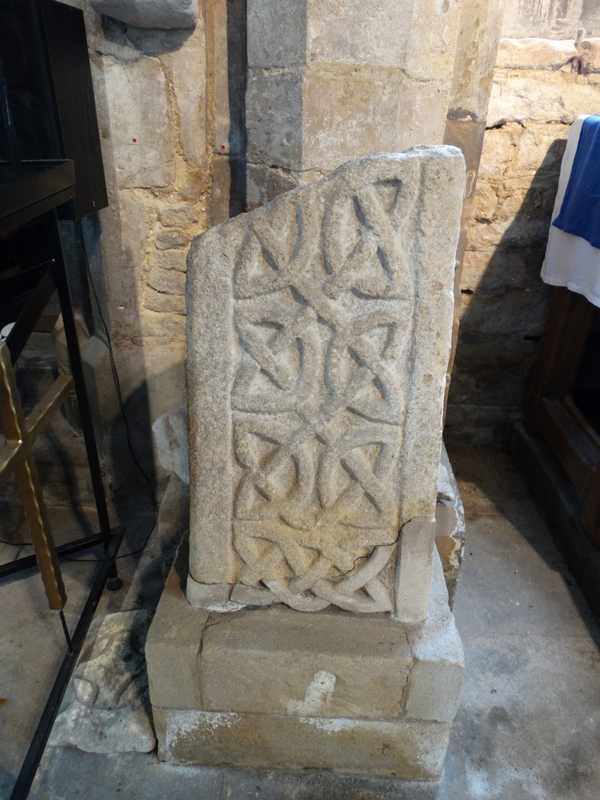 It was originally a Saxon church, and you can still see the Herringbone work. 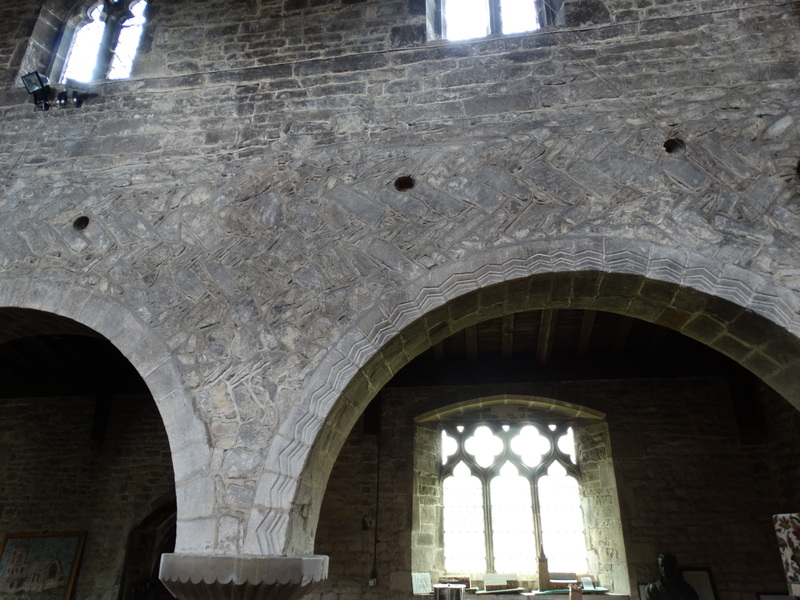 Nice Norman arches, preserved in a Victorian restoration. 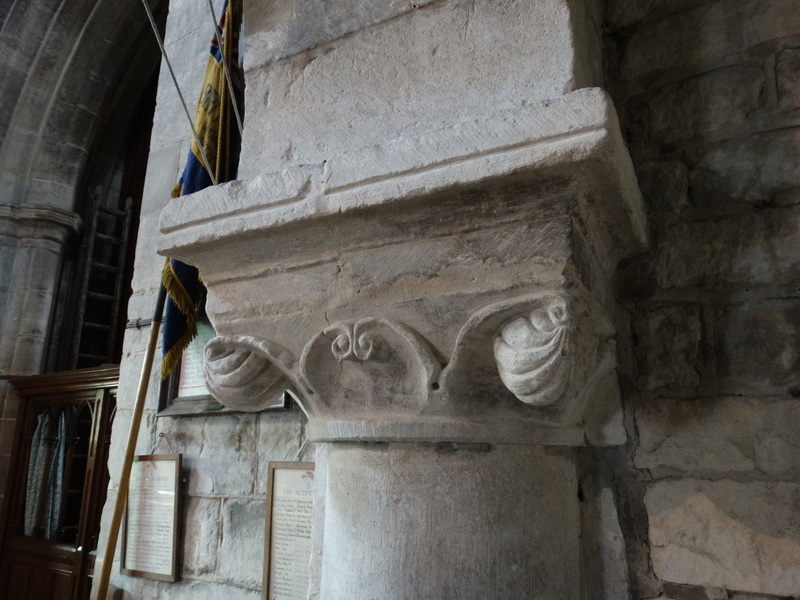 Isaac was baptised here in 1642 and, hidden behind the organ, is a sundial which everyone is certain Isaac made. There is another on the outside, and other churches in the area also claim an Isaac connection (I like the idea of an “Isaac Newton Sundial Trail”). 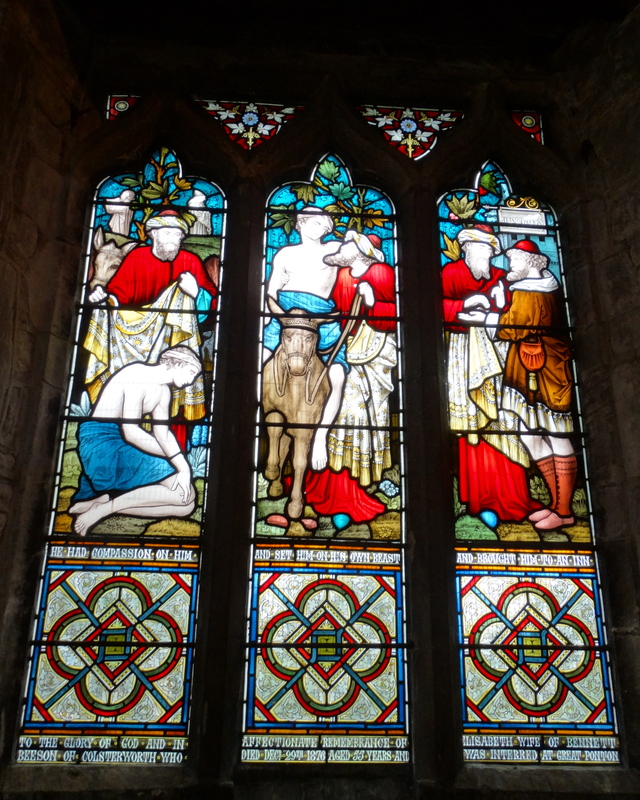 A nice couple of windows – Good Samaritan, and Patrick and Hugh. 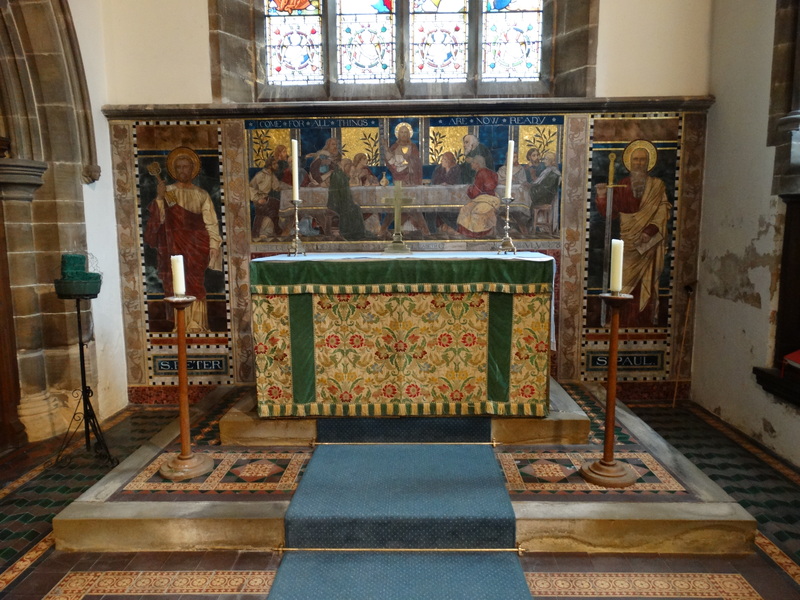 A nice Victorian reredos. 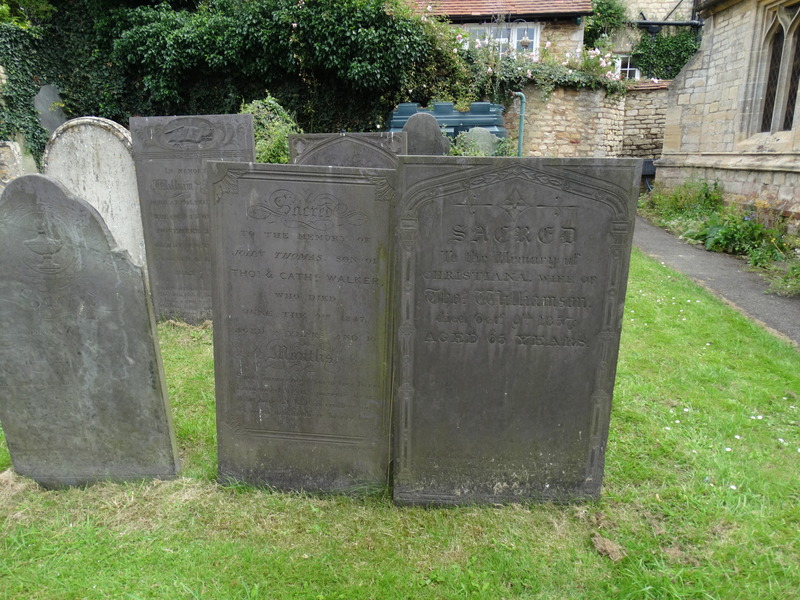 I commented on the weight of the tower and the proximity of the boundary – with the land a lot lower outside the churchyard, and was reminded that this is Ironstone country. Ivo Peters, the great railway photographer, took some wonderful film in this part of the world – but it’s only available on video, and has never been transferred to dvd. The Warden pointed out some interesting inscriptions on the tower and the walls outside (but I didn’t manage photos that show them), and there are some good solid headstones. We had a talk about building on the heritage potential, doing some re-ordering, and keeping the church open and alive into this century. The National Trust has a science centre at the Manor. 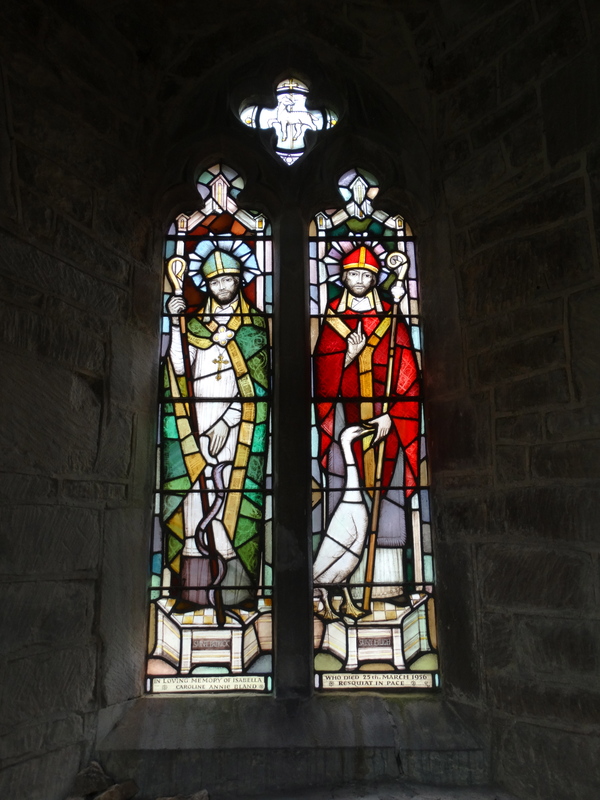 Wouldn’t it be marvellous if there could be a proper display in the church which looks at the links between religion and science, the scientists who are men and women of faith – is it worth talking to the organisation Christians in Science? Our faith is not simply “heritage”, and it is an intellectual faith – God gave us brains! Trinity College Cambridge, a place of huge intellect and scientific achievement, are their patrons – can they work together? The Church Times on 23 September 2016 reported that the Church is to raise its profile, doing a Choral Evensong as part of the Gravity Fields Festival – website – excellent! This entry was posted in Lincolnshire, National Trust, Outside Northumberland. Bookmark the permalink.